In the 60s and 70s there was an economic boom in Italy. Many people who lived in more rural areas moved to the cities to take advantage of new opportunities. In the 80s, the country then had to incentivize people to move back to those areas and take control of farms and vineyards. They did so with small business agricultural loans. 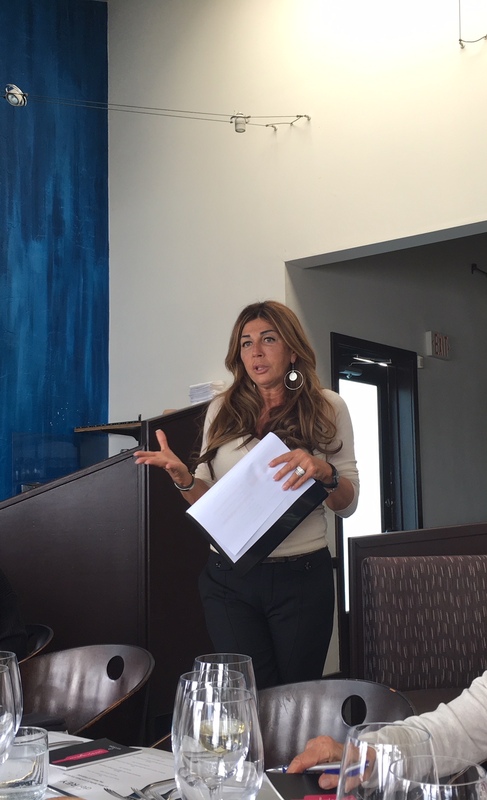 Angela Velenosi took advantage of these economic incentives and started Velenosi Winery with her then husband, Ercole. Velenosi is located just outside the town of Ascoli Piceno in Marche, Italy. The Marche region is on the central coast of Italy on the Adriatic side. Continental influences come from the west (from the Apeninne Range) and moderate maritime influence come from the east. Velenosi was founded in 1984 by Angela and Ercole with 9 hectares. They now own 148 hectares total and have grown to 2.5 million bottle annual case production! Angela was our guest at the Velenosi Winery LA Wine Writers luncheon in March. She is a beautiful and smart Italian woman who started this venture when she was only 20 years old! Our intimate group enjoyed this time with Angela. We heard about her journey in the wine world and got to delve into her portfolio of wines, which were paired beautifully with fare from Cafe del Rey. As always, this lunch did not disappoint. Pecorino is an indigenous grape to Marche. The wine is round and creamy with medium + body and a nice saltiness/brininess. The creaminess comes from 3 mos of lees contact and battonage. Fun fact: there are sheep on this vineyard that eat the grapes from the vine in the fall. These sheep then provide the milk for Pecorino cheese! I love both this wine and this pairing. Such a simple thing to whip up if you’re having friends over: toasted rye bread, a schmear of goat cheese (with herbs if you have ‘em), plus an EVOO drizzle and some fresh cracked black pepper. This wine had an almost pink color to it. Lots of stone fruit (both on the nose and palate) made this a great pairing with the stone fruit salad. This wine is creamy, structured, and has ageability. This dish was delicious and incredibly unique. I was inspired to try and recreate this, but I wouldn’t have the faintest idea of where to start. An inspiring pairing. One does not overpower the other. They dance with each other, though this wine sings on its own. A perfumed note of violet petals plus an earthiness/twigginess. A very dry and almost astringent wine. My favorite wine of the day. This is one of Velenosi’s hallmark wines. 85% Montepulciano, 8% Cabernet Sauvignon, and 7% Merlot. Red and black fruit, meatiness, plus vanilla and other baking spices. Dried flower as well. Medium + mouth-drying tannins. Wow! To both the wine and this dish! The wine gives me: black fruit, spice (black pepper), leather, and black licorice. Also dried black cherries. Powerful, structured, and layered. You almost want to chew it. This wine was a “Tre Biccheri” at Gambero Rosso. This wine was made in the “apassimento” method. 100% Vernaccia Nera is hand-picked. 50% is fermented right away and the other 50% is dried for 3 months and then fermented. The two parts are blended together and put through a 3rd fermentation for 9-10 months. Reminded me of a rustic, sparkling Amarone.